[12 October 2016] Political discourse today seems to hinge on perceptions of strength as intractibility. Strong claims are made, and extreme words used. While many voices express horror at the words and attitudes of US Republican presidential candidate Donald Trump, we should not forget that there are tens of thousands of people who are delighted with him. More than seventeen thousand Twitter users retweeted his false claim to have won both TV debates by a landslide according to every poll. It would be foolish and illogical to hope that this segment of the population will vanish, should their candidate not win. Instead we must try to understand the mechanism of support for someone who insults and lies – why this style evokes joyful support from a proportion of the population. This same analysis might be useful in understanding not only the 2016 US presidential election, but also possibly the rise and popularity of other leaders, such as Validmir Putin. I wish to reach beyond the easy denigration of populism for several reasons. The first is that the definition of populism diverges widely. Many definitions hinge on a sort of elitism – either describing populism as the people rising up against elitist groups, or describing the people who are not supporting the elite, as ignorant. Populism itself is not the danger. It is the passionate rhetoric which indicates the danger. The danger comes from decisions being made on irrational grounds, on emotion rather than truth. I suspect that one characteristic which appeals to voters is Donald Trump’s certainty. He does not doubt his words – even when he is wrong, and even when he is lying. That certainty looks like strength. And, it seems that a sense of there being a strong side to join, might be the element that appeals to those who do not feel satisfied by mainstream politics. Even when changing his stated point of view, Donald Trump projects certainty. A second aspect of his attraction seems to be his refusal to speak in accordance with the rules of etiquette. His language, coarseness, insults and emotion, together seem to build an image of Donald Trump as an ‘ordinary man’. As with the sense of certainty even when the viewpoint has flipped, the sense of ordinariness is somehow not contradicted by the immense wealth of Trump today and in his background. Trump comes across as a man of action. He has made many statements of what he would do on his very first day in office, emphasizing the speed with which he will act. This must ease any sense of frustration with the slowness of action. The lack of nuance in Trump’s statements is probably also a relief. Dealing with complexity is difficult: this is one reason that we tend not to have direct democracy but rather systems in which we voters delegate to others – such as members of parliaments – the work of understanding the complicated issues of understanding the interrelationships between different parts of policy. The balancing of powers between various branches of government also help ensure attention to the complexity. The points of view that can be conveyed in a few minutes, are often over-simplified. However, a clever speaker can use the simple statements very effectively in hooking into emotions such as pride, joy, anger. The skills needed to campaign and make stirring speeches are quite different from the skills needed for wise leadership. The speed of governance is slower, more detailed, and depends on a balanced system. That campaigning and decent policy-making are different sets of skills is becoming obvious as leaders amp up the conflict between Russia and the West. Signs of conflict seem to be increasing. So, for example, plea in the Council of Europe Parliamentary Assembly by German left parliamentarian Andrej Hunko to consider the Russian point of view when discussing today’s situation in Ukraine – not because it is right but because a solution requires a balanced view of both sides – seems to have gone unheard. A Pew poll in Ukraine found that many people blamed Russia or multiple actors for the conflict. Conflict can help increase the sense of support for the government. The repeated castigation of Russia may be in fact be helping the Putin government to maintain its conflict-oriented approach to European countries. Graph based on YouGov data from polls conducted in September 2016 showing a high level of dissatisfaction with national government in all countries surveyed. One lamentable aspect of democracy is that success is defined by staying in power. And yet a recent YouGov survey indicates the high level of dissatisfaction with governments in all seven countries surveyed. Even the UK – whose government is fairly fresh albeit via resignation of David Cameron – shows almost half the population disapproves of its record, and only a quarter approve. 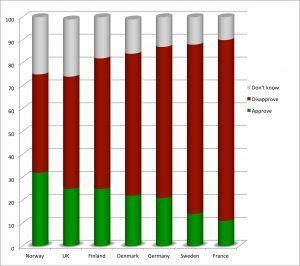 In Germany, just over a fifth of the population approve, and, in France, it is only 11%. Not such good news for the incumbents, considering these two countries will have elections in 2017. Will some of the public cast loyalty to candidates who flout the rules of conduct such as we have seen with Trump and also in Russia? After the end of the Second World War, a number of organisations were set up to improve international cooperation. There was the United Nations at the global level, the Council of Europe for human rights and the rule of law, and the European Union (originally to promote bonds of trade). Today, I have been watching a debate in the Council of Europe Parliamentary Assembly, and I can tell you it moves very slowly! It is likely that the politicians who pioneered these cooperations between countries, might have known first-hand how simplification, anger and fear, and blaming, hadn’t been the best options in the decades past. Their constructive work focussed on cooperation for the protection of human rights, communication to build peace, and the rule of law. (The rule of law is a concept threatened by Donald Trump when he said he would imprison Hillary Clinton.) Balance of power means that the law is set by one part of government and applied fairly to all. It depends on not being certain, honouring detail rather than simplicity, hearing both sides of the story. It depends on believing that the systems that has been developed, will work. When voters are embracing the loud liars, when political discourse consists of insults, then protection of the rule of law and human rights are even more important.